active group holidays for travellers that seek adventure and relaxation - every day. Tailor make each day to suit you for a wellness retreat like no other. Spending your days relaxing on the beach, or a group holiday filled with action and adventure, Crave Rarotonga has it all! See what other guests have to say about Crave Lifestyle retreats. SECURE YOUR SPACE WITH A small deposit of $550. This retreat is now sold out. Please contact us for upcoming options. 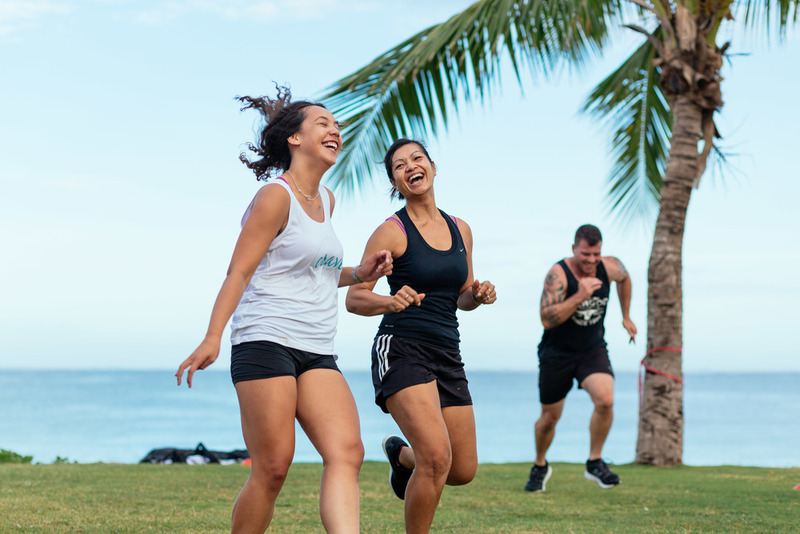 Join us, beachfront on the tropical islands of Rarotonga and Rarotonga, for a wellbeing retreat that is 5 nights and 6 days of fun in the sun, relaxation, wellness and adventure. You'll sweat, you'll stretch, and explore the beauty of the Cook Islands. As with all of our retreats, Crave Rarotonga is all about balance. Choose to relax or get a sweat up with fitness classes and adventures, while unwinding and having fun with a group of likeminded people that will fast become friends! * Please note the time difference between NZ and the Cook Islands. Crave retreat dates are in NZ time. Crave Rarotonga & Aitutaki wellness retreat will depart NZ on Tuesday 24th April, arriving in Rarotonga on Monday 23rd April. You will depart Rarotonga on Saturday 28th April, arriving back in New Zealand on Sunday 29th April. This retreat is now sold out. please contact us for future retreats. All the beach and relaxation time you like! Find your Flow package - daily yoga and pilates practice at different locations around the island, including SUP Yoga. Lasting Wellness package - includes a focus on one-on-one training, goal setting, and program support when you return home. Tropical Adventure package - fill your days with tours, trips and all sorts of culture; making the most of everything that Rarotonga has to offer! We work with you on this to make sure you're getting the activities that you want. Choose from mountain biking, kitesurfing, SUP, paintball, off-road buggy adventures and more. We have a dedicated travel agent partner that can help with all of your additional travel needs. If you'd like to extend your stay on Rarotonga, or out at the beautiful island of Aitutaki, we can help to arrange everything for you.